Not to be confused with Millenarianism. For the Christian doctrine regarding Jesus Christ's reign in heaven, see Session of Christ and Intercession of Christ. For an overview of the earthly reign of the messiah in Abrahamic religions, see Messianic age. Millennialism (from millennium, Latin for "a thousand years"), or chiliasm (from the Greek equivalent), is a belief advanced by some religious denominations that a Golden Age or Paradise will occur on Earth prior to the final judgment and future eternal state of the "World to Come". Christianity and Judaism have both produced messianic movements from time to time which featured millennialist teachings - such as the notion that an earthly kingdom of God was at hand. These millenarian movements often led to considerable social unrest. Similarities to millennialism appear in Zoroastrianism, which identified successive thousand-year periods, each of which will end in a cataclysm of heresy and destruction, until the final destruction of evil and of the spirit of evil by a triumphant king of peace at the end of the final millennial age. "Then Saoshyant makes the creatures again pure, and the resurrection and future existence occur" (Zand-i Vohuman Yasht 3:62). Scholars have also linked various other social and political movements, both religious and secular, to millennialist metaphors. Millennialist thinking first emerged in Jewish literature of the tumultuous intertestamental period (200 BCE to 100 CE), producing writings such as the Book of Enoch, the Book of Jubilees, Esdras, and the additions to Daniel. Passages within these texts, including 1 Enoch 6-36, 91-104, 2 Enoch 33:1, and Jubilees 23:27, refer to the establishment of a "millennial kingdom" by a messianic figure, occasionally suggesting that this kingdom would endure for a thousand years. However, the actual number of years given for the duration of the kingdom varied. In 4 Ezra 7:28-9, for example, the kingdom lasts only 400 years. This notion of the millennium no doubt helped some Jews to cope with the socio-political conflicts that they faced. This concept of the millennium served to reverse the previous period of evil and suffering, rewarding the virtuous for their courage while punishing evil-doers, with a clear separation of those who are good from those who are evil. The vision of a thousand-year period of bliss for the faithful, to be enjoyed here in the physical world as "heaven on earth", exerted an irresistible power over the imagination of Jews in the inter-testamental period as well as on early Christians. Millennialism, which had already existed in Jewish thought, received a new interpretation and fresh impetus with the development of Christianity. Gerschom Scholem profiles medieval and early modern Jewish millennialist teachings in his book Sabbatai Sevi, the mystical messiah, which focuses on the 17th-century movement centered on the self-proclaimed messiahship (1648) of Sabbatai Zevi (1626–1676). Christian millennialism developed out of a Christian interpretation of Jewish apocalypticism. He seized the dragon, that ancient serpent, who is the Devil and Satan, and bound him for a thousand years and threw him into the pit and locked and sealed it over him, so that he would deceive the nations no more, until the thousand years were ended. After that, he must be let out for a little while. Thus, John of Patmos characterizes a millennium where Christ and the Father will rule over a theocracy of the righteous. While there are an abundance of biblical references to such a kingdom of God throughout the Old and New Testaments, this is the only reference in the Bible to such a period lasting one thousand years. The literal belief in a thousand-year reign of Christ is a later development in Christianity, as it does not seem to have been present in first century texts. The same writer gives also other accounts which he says came to him through unwritten tradition, certain strange parables and teachings of the Saviour, and some other more mythical things. To these belong his statement that there will be a period of some thousand years after the resurrection of the dead, and that the kingdom of Christ will be set up in material form on this very earth. I suppose he got these ideas through a misunderstanding of the apostolic accounts, not perceiving that the things said by them were spoken mystically in figures. For he appears to have been of very limited understanding, as one can see from his discourses. But it was due to him that so many of the Church Fathers after him adopted a like opinion, urging in their own support the antiquity of the man; as for instance Irenaeus and any one else that may have proclaimed similar views. Nevertheless, strong opposition later developed from some quarters, most notably from Augustine of Hippo. The Church never took a formal position on the issue at any of the ecumenical councils, and thus both pro and con positions remained consistent with orthodoxy. The addition to the Nicene Creed was intended to refute the perceived Sabellianism of Marcellus of Ancyra and others, a doctrine which includes an end to Christ's reign and which is explicitly singled out for condemnation by the council [Canon #1]. The Catholic Encyclopedia notes that the 2nd century proponents of various Gnostic beliefs (themselves considered heresies) also rejected millenarianism. I admitted to you formerly, that I and many others are of this opinion, and [believe] that such will take place, as you assuredly are aware; but, on the other hand, I signified to you that many who belong to the pure and pious faith, and are true Christians, think otherwise. Melito of Sardis is frequently listed as a second century proponent of premillennialism. The support usually given for the supposition is that "Jerome [Comm. on Ezek. 36] and Gennadius [De Dogm. Eccl., Ch. 52] both affirm that he was a decided millenarian." And 6,000 years must needs be accomplished, in order that the Sabbath may come, the rest, the holy day "on which God rested from all His works." For the Sabbath is the type and emblem of the future kingdom of the saints, when they "shall reign with Christ," when He comes from heaven, as John says in his Apocalypse: for "a day with the Lord is as a thousand years." Since, then, in six days God made all things, it follows that 6, 000 years must be fulfilled. (Hippolytus. On the HexaËmeron, Or Six Days' Work. From Fragments from Commentaries on Various Books of Scripture). Around 220, there were some similar influences on Tertullian, although only with very important and extremely optimistic (if not perhaps even postmillennial) modifications and implications. On the other hand, "Christian Chiliastic" ideas were indeed advocated in 240 by Commodian; in 250 by the Egyptian Bishop Nepos in his Refutation of Allegorists; in 260 by the almost unknown Coracion; and in 310 by Lactantius. Into the late fourth century, Bishop Ambrose of Milan had millennial leanings (Ambrose of Milan. Book II. On the Belief in the Resurrection, verse 108). Lactantius is the last great literary defender of chiliasm in the early Christian church. Jerome and Augustine vigorously opposed chiliasm by teaching the symbolic interpretation of the Revelation of St. John, especially chapter 20. In a letter to Queen Gerberga of France around 950, Adso of Montier-en-Der established the idea of a "last World Emperor" who would conquer non-Christians before the arrival of the Antichrist. Christian views on the future order of events diversified after the Protestant reformation (c.1517). In particular, new emphasis was placed on the passages in the Book of Revelation which seemed to say that as Christ would return to judge the living and the dead, Satan would be locked away for 1000 years, but then released on the world to instigate a final battle against God and his Saints (Rev. 20:1–6). Previous Catholic and Orthodox theologians had no clear or consensus view on what this actually meant (only the concept of the end of the world coming unexpectedly, "like a thief in a night", and the concept of "the antichrist" were almost universally held). Millennialist theories try to explain what this "1000 years of Satan bound in chains" would be like. 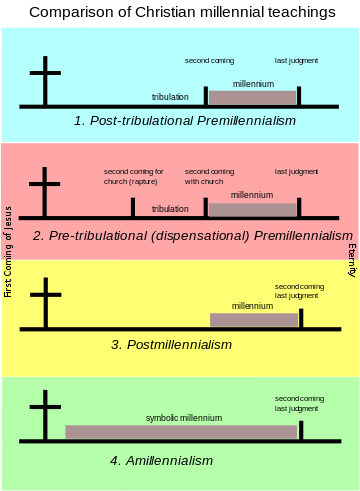 Various types of millennialism exist with regard to Christian eschatology, especially within Protestantism, such as Premillennialism, Postmillennialism, and Amillennialism. The first two refer to different views of the relationship between the "millennial Kingdom" and Christ's second coming. Premillennialism sees Christ's second advent as preceding the millennium, thereby separating the second coming from the final judgment. In this view, "Christ's reign" will be physically on the earth. Postmillennialism sees Christ's second coming as subsequent to the millennium and concurrent with the final judgment. In this view "Christ's reign" (during the millennium) will be spiritual in and through the church. Amillennialism basically denies a future literal 1000 year kingdom and sees the church age metaphorically described in Rev. 20:1–6 in which "Christ's reign" is current in and through the church. The Antichrist's deception already begins to take shape in the world every time the claim is made to realize within history that messianic hope which can only be realized beyond history through the eschatological judgment. The Church has rejected even modified forms of this falsification of the kingdom to come under the name of millenarianism, especially the "intrinsically perverse" political form of a secular messianism. The early Christian concept had ramifications far beyond strictly religious concern during the centuries to come, as it was blended and enhanced with ideas of utopia. It was believed that the Age of the Holy Spirit would begin at around 1260, and that from then on all believers would be living as monks, mystically transfigured and full of praise for God, for a thousand years until Judgment Day would put an end to the history of our planet. The New Age movement was also highly influenced by Joachim of Fiore's divisions of time, and transformed the Three Ages philosophy into astrological terminology. The Age of the Father was recast as the Age of Aries, the Age of the Son became the Age of Pisces, and the Age of the Holy Spirit was called the Aquarian New Age. The current so-called "Age of Aquarius" will supposedly witness the development of a number of great changes for humankind, reflecting the typical features of millennialism. Jehovah's Witnesses believe that Christ will rule from heaven for 1,000 years as king over the earth, assisted by 144,000 holy ones. Bahá'u'lláh mentioned in the Kitáb-i-Íqán that God will renew the "City of God" about every thousand years, and specifically mentioned that a new Manifestation of God would not appear within 1000 years (1893-2893) of Bahá'u'lláh's message, but that the authority of Bahá'u'lláh's message could last up to 500,000 years. The Theosophist Alice Bailey taught that Christ (in her books she refers to the powerful spiritual being best known by Theosophists as Maitreya as The Christ or The World Teacher, not as Maitreya) would return “sometime after AD 2025”, and that this would be the New Age equivalent of the Christian concept of the Second Coming of Christ. The most controversial interpretation of the Three Ages philosophy and of millennialism in general is Adolf Hitler's "Third Reich" ("Drittes Reich"), which in his vision would last for a thousand years to come ("Tausendjähriges Reich"), but which ultimately only lasted for 12 years (1933–1945). the German Empire – under the Hohenzollern dynasty (1871–1918) (the "Second Reich") – The Age of the Son. the "Third Reich" – The Age of the Holy Ghost. Although van den Bruck was unimpressed by Hitler when he met him in 1922 and did not join the Nazi Party, the phrase was nevertheless adopted by the Nazis to describe the totalitarian state they wanted to set up when they gained power, which they succeeded in doing in 1933. Later, however, the Nazi authorities banned the informal use of "Third Reich" throughout the German press in the summer of 1939, instructing it to use more official terms such as "German Reich", "Greater German Reich", and "National Socialist Germany" exclusively. During the early part of the Third Reich many Germans also referred to Hitler as being the German Messiah, especially when he conducted the Nuremberg Rallies, which came to be held at a date somewhat before the Autumn Equinox in Nuremberg, Germany. [...] einem tausendjährigen Volk mit tausendjähriger geschichtlicher und kultureller Vergangenheit für die vor ihm liegende unabsehbare Zukunft eine ebenbürtige tausendjährige Stadt zu bauen [...]. Millenium [sic]: Since the Holy Office decreed (July 21, 1944) that it cannot safely be taught that Christ at His Second Coming will reign visibly with only some of His saints (risen from the dead) for a period of time before the final and universal judgment, a spiritual millennium is seen in Apoc. 20:4–6. St. John gives a spiritual recapitulation of the activity of Satan, and the spiritual reign of the saints with Christ in heaven and in His Church on earth. Millennial social movements are a specific form of millenarianism that are based on some concept of a one thousand-year cycle. Sometimes the two terms are used as synonyms, but this is not entirely accurate for a purist. Millennial social movements need not be religious, but they must have a vision of an apocalypse that can be utopian or dystopian. Those who are part of millennial social movements are "prone to be violent," with certain types of millennialism connected to violence. The first is progressive, where the "transformation of the social order is gradual and humans play a role in fostering that transformation." The second is catastrophic millennialism which "deems the current social order as irrevocable corrupt, and total destruction of this order is necessary as the precursor to the building of a new, godly order." However the link between millennialism and violence may be problematic, as new religious movements may stray from the catastrophic view as time progresses. ^ Some examples are given by Gerschom Scholem in Sabbatai Sevi, the mystical messiah (London: Routledge, 1973). The whole book profiles a Jewish group of this kind centered on the person of Sabbatai Zevi, but in part 1 Scholem also gives a number of comparable Christian examples, e.g. p. 100 - 101. ^ Compare: Tabor, James D. (2016) . "13: Ancient Jewish and Early Christian Millennialism". In Wessinger, Catherine (ed.). The Oxford Handbook of Millennialism. Oxford Handbooks (reprint ed.). New York: Oxford University Press. p. 254. ISBN 9780190611941. Retrieved 2019-02-05. Millennialism, as it developed in emerging forms of Judaism around 200 B.C.E., was a response to a much older conceptual problem and a specific historical crisis brought on by a program of Hellenization initiated by the Macedonian ruler, Antiochus IV (r. 175-164 B.C.E. ), a successor of Alexander the Great (256-323 B.C.E. ), who had conquered Syria-Palestine in 332 B.C.E. ^ Gerschom Scholem, Sabbatai Sevi, the mystical messiah (London: Routledge, 1973). Scholem also gives examples of other Jewish millennialist movements. ^ Theology Today, January 1996, Vol. 53, No. 4, pp. 464–476. On-line version here. ^ Eusebius. Church History (Book III). ^ Luke 1:33 and Stuart Hall, Doctrine and Practice of the Early Church (Grand Rapids: Eerdmans, 1992), 171. ^ "Western Reformed Seminary". www.wrs.edu. ^ "Dr F N Lee - Sermon". www.dr-fnlee.org. ^ "CHURCH FATHERS: Dialogue with Trypho, Chapters 69-88 (Justin Martyr)". www.newadvent.org. ^ Taylor, Voice of the Church, P. 66; Peters, Theocratic Kingdom, 1:495; Walvoord, Millennial Kingdom, p. 120; et al. ^ Richard Cunningham Shimeall, Christ's Second Coming: Is it Pre-Millennial or Post-Millennial? (New York: John F. Trow, 1865), p. 67. See also, Taylor, p. 66; Peters, 1:495; Jesse Forest Silver, The Lord’s Return (New York, et al. : Fleming H. Revell Co., 1914), p. 66; W. Chillingworth, The Works of W. Chillingworth, 12th ed. (London: B. Blake, 1836), p.714; et al. ^ Gawrisch, Wilbert (1998). Eschatological Prophecies and Current Misinterpretations in Our Great Heritage, Volume 3. Milwaukee: Northwestern Publishing House. pp. 688–689. ISBN 0810003791. ^ "Primary Sources - Apocalypse! FRONTLINE - PBS". www.pbs.org. ^ Catechism of the Catholic Church. Imprimatur Potest +Joseph Cardinal Ratzinger. Doubleday, NY 1995, p. 194. ^ The Kitáb-i-Íqán, pg. 199. ^ McMullen, Michael D. (2000). The Baha'i: The Religious Construction of a Global Identity. Atlanta, Georgia: Rutgers University Press. p. 7. ISBN 0-8135-2836-4. ^ The Kitáb-i-Aqdas, gr. 37. ^ Bailey, Alice A. The Reappearance of the Christ New York:1948 Lucis Publishing Co.
^ Lewis (2004). Lewis, James R. (ed.). The Oxford Handbook of New Religious Movements. Oxford University Press. ISBN 0-19-514986-6. Case, Shirley J. The Millennial Hope, The University of Chicago Press, 1918. Cohn, Norman. The Pursuit of the Millennium: Revolutionary Millenarians and Mystical Anarchists of the Middle Ages, (2nd ed. Yale U.P., 1970). Pentecost, J. Dwight. Things to Come: A study in Biblical Eschatology(Zondervan, 1958) ISBN 0-310-30890-9 and ISBN 978-0-310-30890-4. Wojcik, Daniel (1997). The End of the World as We Know It: Faith, Fatalism, and Apocalypse in America. New York University Press. ISBN 0-8147-9283-9. Catholic Encyclopedia "Millennium and Millenarianism"